AS in Geno's steaks...South Phila, Pa. The customer is always right? Not at Geno's Steaks in South Philadelphia. 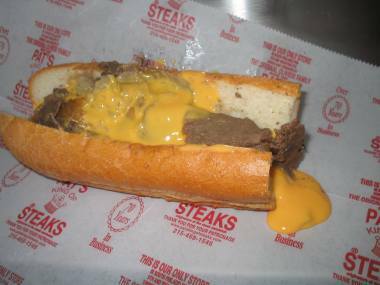 Belly up to its counter and order a cheesesteak in a language other than English, and you'll walk away hungry. It seems that Joseph Vento, Geno's owner, feels strongly that everyone in this country ought to speak English - even if they're tourists from faraway climes looking for that fabled Philly cheesesteak fix. Vento insists his customers order in English. No pointing at the menu items. Speak English, a sign at Vento's popular, curbside counter reads. This comes from a man whose Italian-born grandparents spoke limited English. Talk about irony thicker than Cheez Whiz. I have an idea, 'specially for those of you who "can't speak English." Walk across the street...and give your business to Pat's. Just Have the Baby, For Chrissakes!